In the interest of writing down things I’ve found myself repeating, I’m composing a short guide on Salt Lake City (and to a lesser degree, Utah). If you find yourself visiting Salt Lake, you may find this short guide useful. I owe a special thanks to the many faculty in the School of Computing at the University of Utah who sent in suggestions for this article. Also see the Utah tag on my colleague John Regehr’s blog. Salt Lake City, Utah is the center of the populated Wasatch front. The populated Wasatch front is a contiguous corridor of civilization nestled between the Wasatch mountains to the east and the Great Salt Lake, Oquirrh mountains and Utah lake to the west. It takes about two hours to drive from one end of the populated Wasatch front to the other, or about an hour to either end starting from Salt Lake City. Much of the entire population of Utah (about 3 million people in 2014) lives along or near this band. Park City, home of the Sundance film festival, is about 35 minutes from downtown Salt Lake City, accessible via an interstate pass through the Wasatch mountains. Major ski resorts such as Snowbird and Alta sit atop the canyons adjacent to the city itself. Residents often describe Salt Lake as a “big enough” city: Salt Lake is big enough to have the amenities one expects from a major U.S. city, but still small enough to avoid frustrations like traffic or parking problems. More recently, Salt Lake has become known for being the first major American city to end homelessness, as covered by The Daily Show, and Fodor’s picked Utah as its number one travel destination over Cuba, Sicily and Nepal. Air travel to and from to Salt Lake City is convenient, with Salt Lake serving as the major western U.S. hub for Delta Airlines. There are direct flights to many U.S. cities, and direct flights to major international hubs such as Tokyo and Paris. Downtown is about 15 minutes by car or about 20 minutes by light rail from the airport. Within the city, the rapidly expanding TRAX light rail connects much of the greater Salt Lake metropolitan area. A newly added North-South commuter rail called FrontRunner connects almost the entire population of the Wasatch front together. Navigation by car is simple: the wide streets of Salt Lake are set up as a Cartesian grid: every address is a coordinate specifying how far north/south or east/west a location is from the origin. For instance, the address 100 S 1300 E is one block south of the origin and 13 blocks east of the origin. There’s rarely a need to ask for directions: every address contains enough information to navigate to that address. The grid keeps traffic manageable: according to Salt Lake census data, the average home-to-work commute time in Salt Lake is about 19 minutes, among the lowest of major metropolitan areas. A recent city initiative has added bike lanes along major roads in Salt Lake, and the public transit authority operates a public Bicycle Transit Center, including rentals and repairs. City government has also dispersed Bike Rental Stations throughout the city. For staying downtown, I recommend the Grand America, the Little America or the Hotel Monaco. My colleague Suresh Venkatasubramanian has scripted a dining map for Salt Lake City with Google Maps Engine. Virtually everything in Salt Lake is kid-friendly. Demographically, Utah is unique in many regards. Utah has the highest birthrate and the third-fastest fastest population growth rate, growing about 33% a decade: over the next decade, Utah will add about one million residents. Utah has the youngest population of any state with a median age of 29. Utah ranks among the highest in residents out of poverty, employment and high school completion. Salt Lake City is on track to become the first city in the country to end homelesseness. About 60% of the state are Mormons (locally referred to as LDS), and Salt Lake City is approximately 33% Mormon. According to a sampling of Facebook interests, Utah is the “nerdiest” state in the U.S., placing first in over half the categories. As a result, Salt Lake City holds not one but two ComicCons annually. Each draws over 100,000 attendees. Salt Lake experiences all four seasons. Fall and spring are moderate. Temperatures can break 100 F in the peak of summer, and they can hover in the in the 20s in the depths of winter. Even so, the low humidity moderates the effect of both extremes. You’re not as likely to sweat in the summer, and you can be out in shorts at “freezing” temperatures that would seem absurd for someone living on the coastal U.S. during the winter. The low humidity also makes life inhospitable for a number of pests, including fleas and mosquitos. Salt Lake is especially pleasant in the fall and spring. Even in winter Salt Lake has plenty of sunny days. Do bring sunscreen. Visitors to the Salt Lake area are often surprised by the fluffy, “dry” snow. Residents are quick to note that the unusual snow comes from the lake effect, though few know how the lake effect works, or why Salt Lake has a unique lake effect. Other large lakes such as the Great Lakes can generate punishing snow and blizzards with their lake effect. 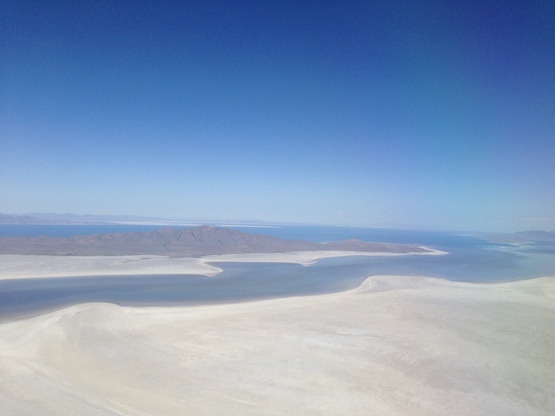 The salinity of the Great Salt Lake, however, has a different effect: it causes snow formation, but does not contribute moisture. Skiiers come to Salt Lake from around the world to experience this delightful substance.